As a former professional River Tay boatman there were certain lures at certain times of the salmon fishing season where I just didn't ever have to doubt their effectiveness. The next few paragraphs will give you my take on the highly successful 'pearly pink' 4 inch Tomic 'Classic' lure. Firstly let me draw your attention to the 'battle scars' that are present on the above 4 inch Tomic 'Classic'. Other than the rub marks from the hook swinging back and forth across the underbelly of the lure (known as the smile) all that other paint damage has been caught by sub surface smash attacks and 'tugs of war' from prime River Tay Spring salmon. Never be put off by the surface paint condition of a lure as it will keep working if you keep using it much longer than you could ever feel comfortable with or imagine. If you're a Tay ghillie that hasn't gained faith in this particular 'weapon' or high water early Spring 'harling' my only advice to you is don't get distracted by the incoming assault of 'mega buck' bass lures from the USA as they are not as good for staying connected to salmon with due to their little bass hooks even though they are very attractive in the water. You don't want a shallow hook hold on a big Tay Springer with a fine wire hook and logic should tell you why. Nor do you want to badly injure a fish when multiple trebles catch the landing net mesh and the salmon inevitably writhes. In saying that these Vision Oneten lures fish fine with a single iron if you rig it up the same way as you see here. The micro barbed single can be perfectly held in 'balanced' position with a twist of fuse wire to the centre redundant hook mound which will 'break away' when a salmon is hooked. The Tomic 4 Inch Classic 'in river' action is an absolute enigma as to what on earth it is reminding a salmon of. If you study the form of the lure as it's fishing you'll see a slowish consistent side to side kick type of waggle that is truly tantalising to salmon. The only thing I could relate it to is maybe a 'backing off' injured squid of some other type of oceanic salmon delicacy. Personally I loved using these most in the big water of Spring and especially on the duller low light days and often I'd be 'harling' 3 of these identical lures at once with the logic that salmon in the ocean are never likely feeding on any more than one food source type at any one time so they are only used to seeing multiples of the same item of prey. On a few occasions over the years I've had 2 rods buckle in the boat at the same time while performing this multiple pearly pink Tomic lure approach. On one such occasion I was out harling the Tay with my late colleague Ian Redford when this happened. I handed Ian one buckled rod put my boot on the other and quickly whipped in the 3rd lure. Ian said to me what are we going to do and I replied where going to make for the riverbank and you run that way and I'll run the other way and we'll see if they part! Two perfect and nearly identical 11 pound sea-liced February springers were soon landed. The 4 inch Classic Tomic has a narrower body than the 'Lucky Louie' originated 'Kynock Killer' which is also another highly successful River Tay salmon 'harling' lure. This slightly less bulky body & smaller front nose gives the 4 inch Classic Tomic a slower less erratic action which personally I like better in the cold water of early Spring. From a salmon's point of view both are highly attractive and from a faith point of view they only ever take the one you're using! The action of a 4 inch Classic Tomic can be speeded up by adjusting & double anchoring the knot position to put the lure's nose down more. That's maybe too much detail though and easier to just switch to a Kynoch or 3 inch Tay Lure equivalent when you want to speed up the action which I always did later in the Spring. This pearlescent finish with a florescent pink stripe is another difficult aspect to truly understand but I think I've got it at least half solved. This pearly white body paint job when delivered sub surface into the Tay transforms into a lovely light golden colour due to the natural sedimentation stain of the river. Gold was always a great attractor for salmon and especially through the Spring months. The florescent pink stripe on any lure is one of the most potent & bright colours when viewed in low light conditions under the UV spectrum. Other florescent non pink colours that appear to our eyes visually brighter pare into insignificance compared to the florescent pink equivalent when the light source reduces hence my earlier comments about the deadly attributes of this amazing lure during lower light days. Harling on the River Tay is a traditional approach that's been deployed for centuries. On the big wide River Tay the boat offers a distinct advantage when it comes to maximising water coverage. The boat also delivers a 'harled' lure or fly over the salmon lies at exactly the right speed which often can be far more difficult to achieve from the riverbank. 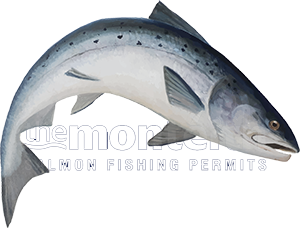 A big part of salmon fishing success is down to 'effective' water coverage and quality lure or fly swim time. The 'law of averages' will be seriously tipped in your favour if you're out on the Tay with one of it's skilled boatmen with 3 lures that are being correctly & systematically swum down through all the suspected salmon holding areas throughout the full course of the fishing day.